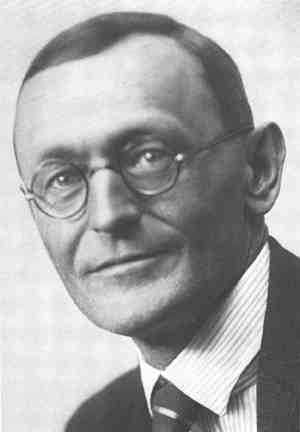 Hermann Hesse is probably my favorite literary figure of the 20th Century. Others like Proust, Orwell, Huxley, Nabakov, Kafka, Frank Herbert are there also. But Hesse stands our for me on the merit of combining a genuine wisdom and insight with a top quality literary style. This quotation is a typical insight of his. We normally imagine when we hate someone we hate them because they are different from us. But it is much more usually the case that it is something we see in them that reminds us of something in ourselves that we do not like to be reminded of for one reason or another. It could be because we are trying to move away from that characteristic whilst the person we hate, we hate because they embrace this characteristic. It could be some sort of psychological instinctual reaction to abhor people with similar strengths and weaknesses to ourselves. As we prefer to be in mutually beneficial relationships. If we both have the same strength then we will compete over it, another cause of rising hatred, as competing gets tiresome when we are having to do it all the time. And if we both have the same weakness, then there is no mutual benefit to be gained other than to indulge in self or mutual self-pity, another thing that does not make for a good friendship. From which we want to gain positive energy, not have our energy depleted and drained from us. So there is much to be taken from this quote. It may seem initially like a typical contrarian type of statement to make. To say something obviously contrary to reality for effect. But in this case this is a long way from the truth. Hatred really does rise against those who share some quality with us. And precisely because they do share this quality. Someone who is different from us we can be indifferent to, friendly with, we can admire, pity, respect, etc.. But someone similar to us in a respect that is not at a distance, but is up close, rubbing it in our face, so to speak, this brings out all our negative qualities of hatred. A person who wants to become like us, or who we want to become like, we can have a great relationship with. Someone who dares to think they are like us, when they may be in fact, but they are not how we would like to be, or how we see ourselves becoming, this causes us to feel a great repulsion to that person. I can see the feeling, I can imagine and feel why it arises, but yet it does remain slightly illogical. What it does illustrate is that friendship and interaction, and relationships with others is a lot more complicated than the scientific explanation would have it, that we simply look for the company of people similar to ourselves. Inertia may suggest this, habits and human economy of effort and laziness may suggest this. But the reality of a dynamic human relationship full of life and energy suggests something more subtle going on. And this seemingly illogical point of Hesse’s about where hatred comes from, and where it arises, hints very much at this.